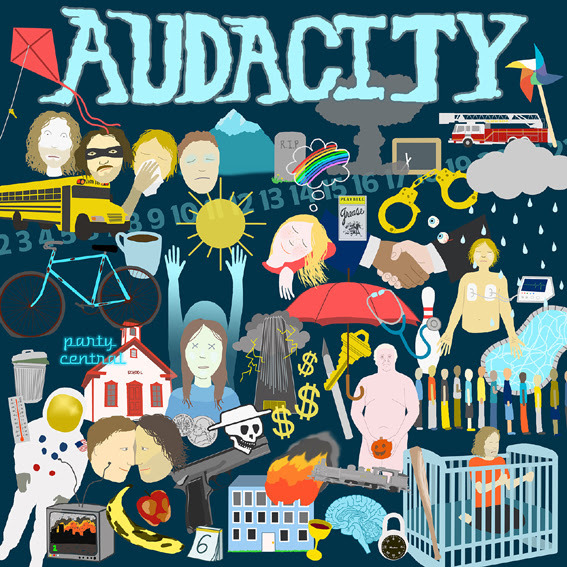 When the members of Audacity started their punk band fifteen years ago they were still teenagers. When you see and hear them now, they are still a group of young dogs, that by now released three full length LP's and a bunch of EP's. A few of those were released by the illustrious Burger Records label. This record company, that also settled in their home town Fullerton California, has a nose for bands that go their own way and this foursome fits in there very well. Hyper Vessels is their fourth album which is released on Suicide Squeeze Records. On the new record you can hear that the boys turned into men and grew some balls. Not that they lost their swagger, since the band still knows how to go full force and the songs still have that garage sound. But it's clear they are on the road to adulthood and this has given the songs more edge. The catchy 'Counting The Days' that opens the LP, may sound very cheerful as if nothing is the matter, but the lads are definitely bringing some depth to their music. For example in the song 'Baseball' where they are wondering why everyone is so occupied with baseball, while the world is on fire. So the sunny character of their music is only just first appearance, where the not always very exciting live in the small town of Fullerton found its way into the recordings. Their music now only got stronger and is still full of irresistible hooks and grooves. 'Dirt Boy' has a sharp sounding solo with a nice build up to the end where we can also hear some nice riffs. More of this is in the fierce 'Riot Train' and 'Hypo' with its heavy guitars. The record hardly loses speed and only has a few more quiet moments. Closer 'Lock On The Door' is a somewhat slow song with a very nice bass line. With garage rock giant Ty Segall on recording duties everything sounds extra sharp. It is nice to conclude that Audacity only gained strength and quality over the years. The many hours on stage probably have something to do with that, but the band also knows how to let this reflect in their song writing. They managed to combine a grown up sound with the youthful eagerness from the beginning of their career and this makes listening to Hyper Vessels a big feast. Listen to 'Hyper Vessels' on Spotify.